This calculated performance sheet was prepeared just a month before the operational introduction of the Bf 109G, by when serial production was already under way. The calculations were acceped as the official performance specifications for the Bf 109G-1 subtype, as these very figures were repeated as reference values in a report on the ERLA factory's speed measurements on 13 serial production aircraft (along with the +/- 3% tolerance limits, ie. a minimum 640, maximum 680 km/h being the borders for acceptance by BAL). Appearantly the calculated dataset proved rather accurate - the avarage of the ERLA values obtained on production airframes was 652 km/h (the accepted airfames results ranged from 632 to 664 km/h, the three rejected airframes below the minimum tolerance not included), and three production airframes exceeding the reference specification; however the avarage the rated altitudes measured (ranging 6450m to 6950m) was lower, 6700m, probably as a result of the greater variance in thermal effiency than expected originally. 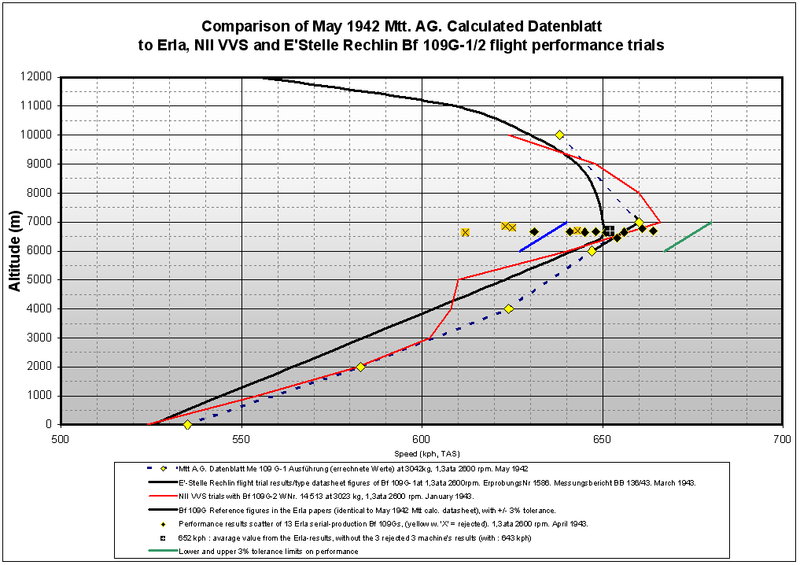 It should be noted that the ERLA values were obtained with 120 mm wide radiator flap opening, about three times of the usual standard Schnellflugstellung (which was 40mm), resulting in higher drag and must have reduced the obtained speed results slightly. Trials at E-Stelle Rechlin on a Bf 109G-1 - the results were later becoming the official specifications for the type in a Kennblatt issued on 8 March 1943 - resulted in 650 kph at 6400m; the tested aircraft appearantly had a fixed tailwheel resulting 12 km/h speed loss, which needs to be taken account. Soviet performance trials at the NII VVS with a captured Bf 109G-2, Werknummer 14 513 are in remarkably good agreement with the Messerschmitt datasheet below : 666 kph was achieved at 7000m altitude. This aircraft's tailwheel was semi-retractable and thus the results are directly comparable to the Messerschmitt datasheet below. Similiar factory trials as Erla's were performed at the W.N.F. and Messerschmitt Regensburg factories underlined Rechlin's (and thus Erla's as well) values. For graphical comparison of these trials, please follow this link. All aformentioned trials were done at Steig- und Kampfleistungs, ie. 1,3ata boost and 2600 rpm. This limitation was in force until October 1943, when the full rating, 1,42ata boost and 2600 rpm was cleared for operational use for the DB 605A-1. Given the great similiarity it can be also applied to the similiar G-2, G-3 and G-4 subtype, from which the G-1 only differed in the presence of pressurized cocpit and/or the radio set. Flugdauer: Es wurden die Abzüge für Warmlaufen usw. entsp. Flugdauer im 6 km mit wirtschl. Dauerleistung. Last updated 17 August 2006.